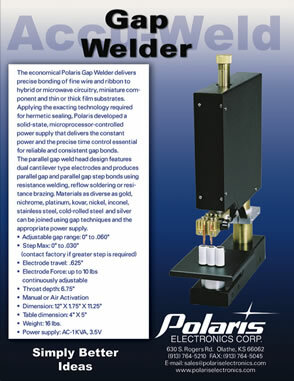 The economical Polaris Gap Welder delivers precise bonding of fine wire and ribbon to hybrid or microwave circuitry, miniature component and thin or thick film substrates. Applying the exacting technology required for hermetic sealing, Polaris developed a sol id-state, microprocessor-controlled power supply that delivers the constant power and the precise time control essential for reliable and consistent gap bonds. The parallel gap weld head design features dual cantilever type electrodes and produces parallel gap and parallel gap step bonds using resistance welding, ref low soldering or resistance brazing. Materials as diverse as gold, nichrome, platinum, kovar, nickel, inconel, stainless steel, cold-rolled steel and silver can be joined using gap techniques and the appropriate power supply.